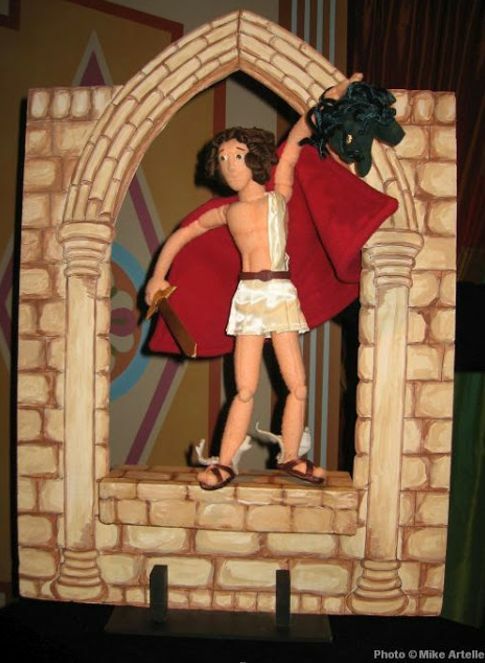 From about the age of nine I've been active as a puppeteer. At first, I began by doing puppetry skits using store bought puppets, having them lip synch to songs. 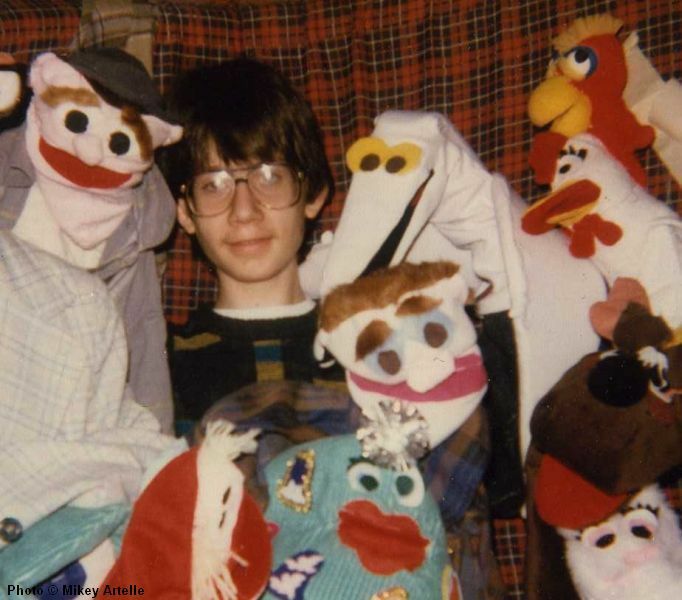 Then in my early teens I started making my own puppets. 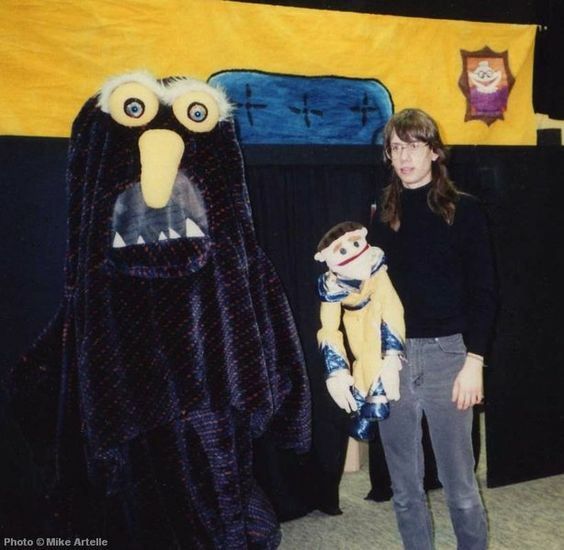 In 1987 I began performing original puppet shows in the Ottawa area at locations such as libraries, churches, community centres, corporate events, and festivals. This continued through to my mid 30's. The above photo was taken in 1987 when I was 14. 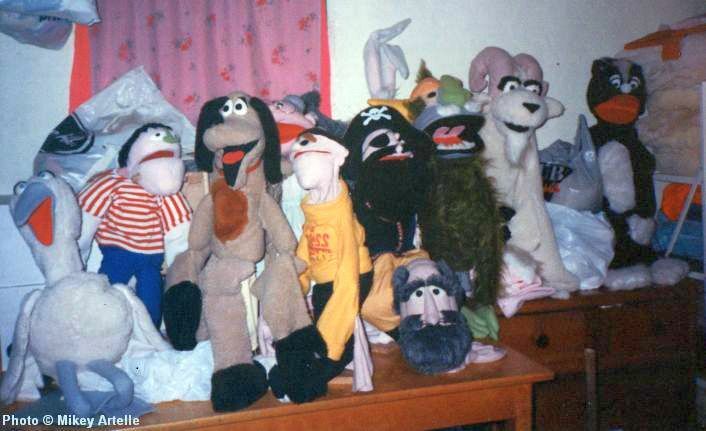 I'm surrounded by some of my very first puppet creations. The puppet next to my head on the left side of the image is Rob the Slob, my first ever puppet character. The white bird-like puppet that I'm holding is a Pterodactyl that I really enjoyed. I brought that puppet with me everywhere. Eventually I made new versions of both characters. 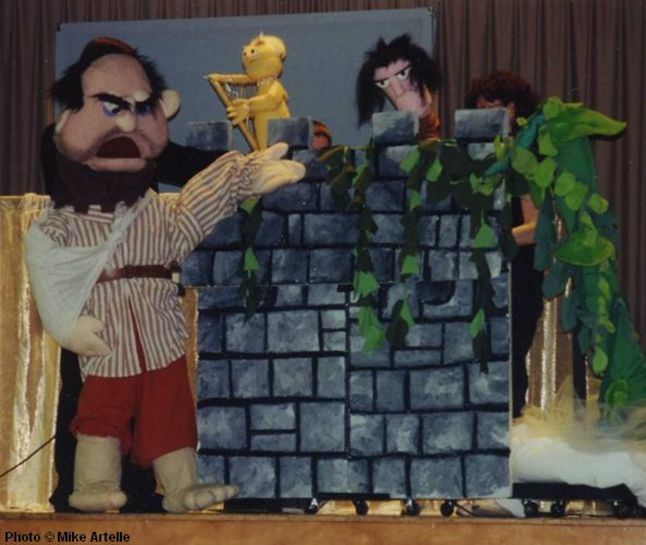 The Three Billy Goats: This puppet show was performed in the late 1980's to the mid 1990's at libraries, community centres, and regional fairs. 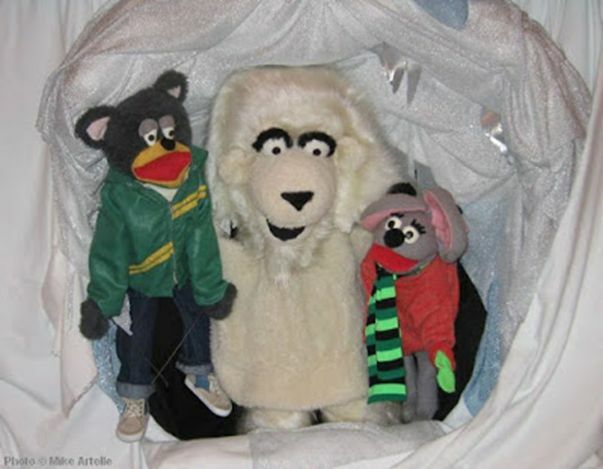 Along with Bruno the Dog, these are the first puppets that I built out of fake fur fabric. 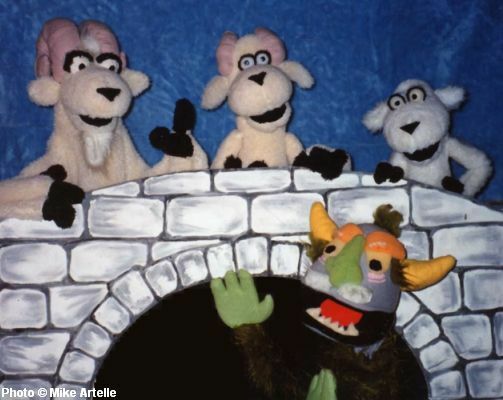 Ramsey the Ram (top left) was the first puppet that I made out of carved sponge. The other puppets shown above are Nanny Goat and Billy Goat with Ned the Nasty Troll. A Christmas Wish: This was performed from around 1990to the early 2000's at churches, community centres and corporation events. This was the second of three Christmas shows. 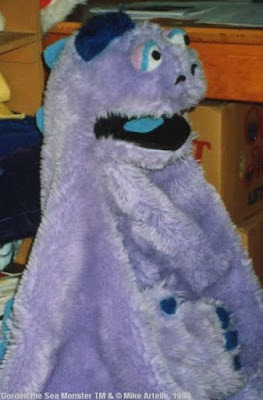 The first was "The Phantom's Christmas" in the late 1980's which featured my first puppet character named Rob the Slob, then came "The Christmas Wish", and last we did "The Case of the Snowman Toppler" which featured a full cast including Tyler the Bear, Mousie Mousie, Bruno the Dog and Gordon the Sea Monster. 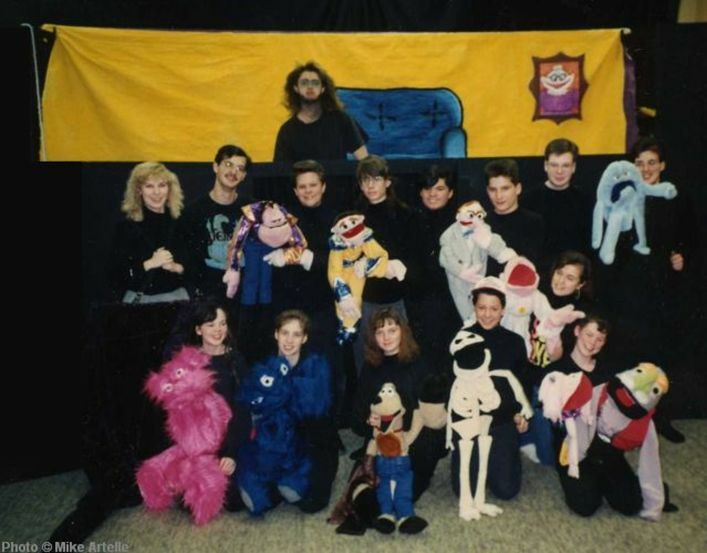 A Space Oddity: During the 1990-91 school year when I was in grade ten my Drama teacher Mr. Jim Ryan (who had an uncanny resemblance to Jim Henson) allowed me to mount a puppet show with my fellow drama students. 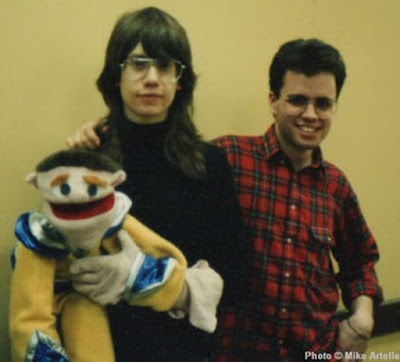 It was called "A Space Oddity" and presented an original story that I wrote about Rob the Slob, my very first puppet character which I'm holding in the above photo. This is the second version of Rob that I made, and the first puppet that I made with new, store bought fleece fabric, rather than recycling fabric from old clothes. Previously, Rob appeared in "The Chocolate Chip Cookie Boy" and "The Phantoms Christmas". Seen next to me here is Georgie the Monster, a costume performed by my friend Bronwyn and voiced by Mr. Ryan! My classmates and I built a special puppet theatre as a class project (seen above in the background) and rehearsed the show on our lunch breaks and after school. We sold tickets and presented the show in March 1991 for a few evenings at the school. Later we did a special performance during school hours for kids from a visiting school. This project was a lot of fun to do and everyone did an excellent job. Here I am after the show with my brother Steven who did the voices for two of the main characters. 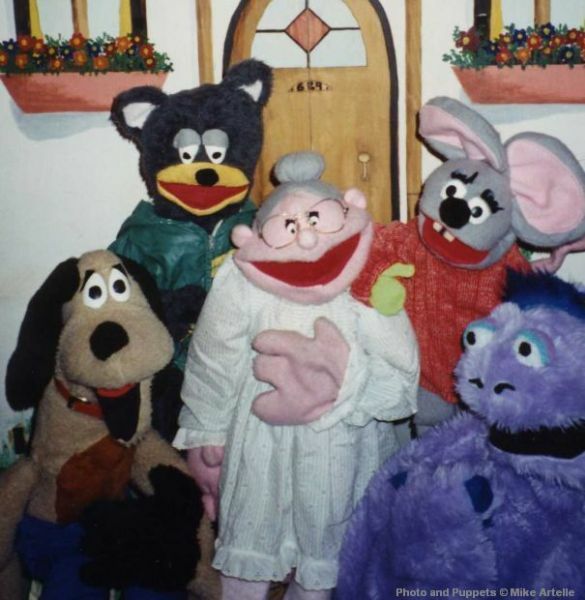 Here is a rare photo showing where my puppets lived in between puppet shows... in our basement. This picture was taken during the late 1980s or early 1990's during my teenage years. By this point my puppets had physically taken over parts of the house. I'm truly blessed to have parents who not only encouraged my creativity, they also condoned having sections of their house look like this! They put up with having puppets ever encroaching on their living space just so that I could explore my passion for puppetry. As funny as this picture is, it brings tears of happiness to my eyes because for me it shows how much my parents love me. My parents are amazing! Guns N' Puppets During my High School years my favourite band was (and still is) Guns N Roses. In 1988 GNR made it big with their album Appetite for Destruction. 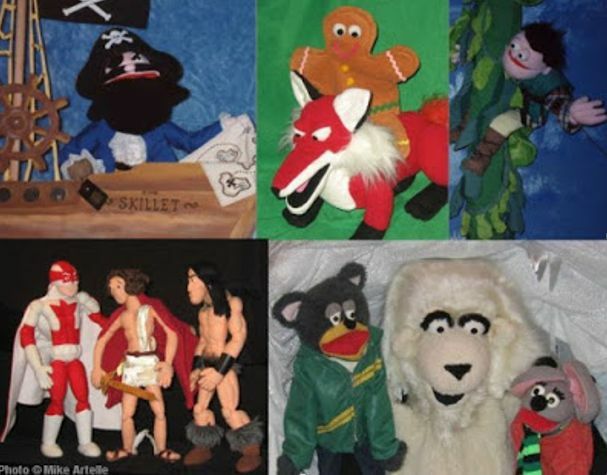 Naturally I had to make puppet parodies of my favourite group, and Guns N Puppets was born. 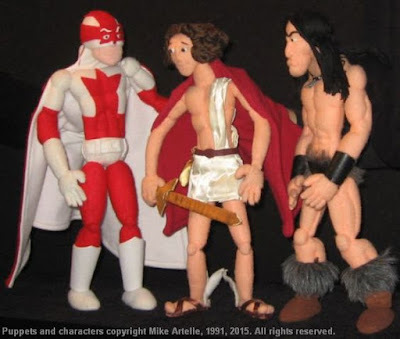 Above left to right are Virgule, Axle Grease, and Morris Laborious. I even made Axle Grease a Guns N Puppets T-shirt! 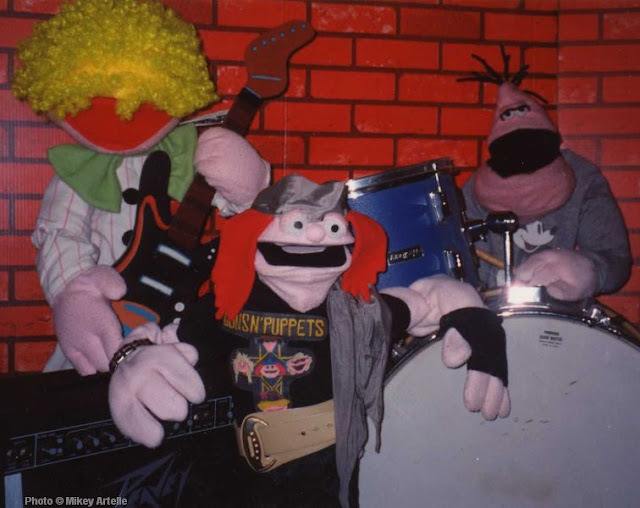 I did several skits with Guns N' Puppets for the school talent show each year in High School, usually lip synching to GNR songs. Some classmates helped out with the rest of the band. At one point Guns N Puppets were featured on a page in the school year book. A few of my buddies helped me make a complete Guns N Puppets music video as a school project, set to AC-DC's Thunderstruck. All we had was a VHS camera, a VCR, a CD player, and a TV to do the editing with. It's very rough around the edges, but I'm still very proud of it and amazed that we managed to pull it off. In 2016 I posted the video on YouTube. It can be viewed below. Enjoy! The Baseball Team: This puppet show is from the early 1990s, and features, L to R: Bruno the Dog, Tyler the Bear, Nanny, Mousie Mousie and Gordon the Sea Monster. I created Gordon the Sea Monster in 1990 and he quickly became my main character. I've posted more about him on another page of this blog, Gordon the Sea Monster and Me. 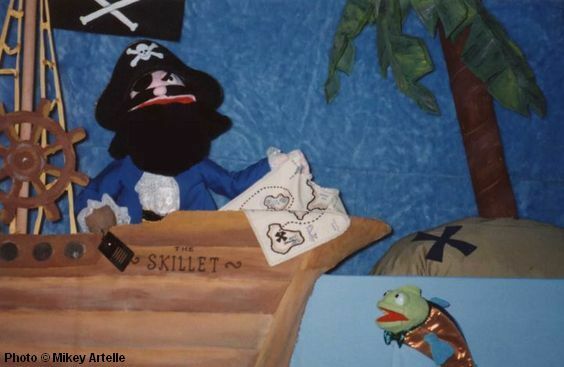 Pirate Mice: The first puppet show that I created for Gordon the Sea Monster in the early 1990's was "The Pirate Mice". Along with Mousie Mousie and her brother Peter Mouse the show featured a pirate named Captain Spatula who became Gordon's nemesis. I had built Captain Spatula in the late 1980s before I made Gordon, so this was the first time that they were paired up together. My mother and I liked thinking of funny pirate expressions for the Captain to say, such as "Blubberin' Blowfish!" or "Sufferin' Seahorse!". When Captain thinks someone is less intelligent than he is or has made a foolish mistake, he calls them a "Bumblin' Barnacle"! Mr. Fishy, seen above, was originally made for a puppet show based on "The Three Billy Goats". Gordon and Fishy teamed up for the first time in "The Pirate Mice" and have been best friends ever since! Jack and the Beanstalk: Mounted in the early 1990's and performed until the late 1990's, and again in 2014. 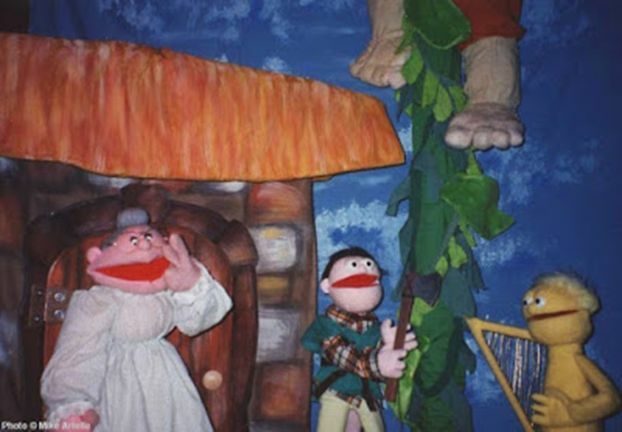 Shown above is Jack's mother, Jack (Jeremy), and the Harp, as the giant comes down the beanstalk. I staged the puppets like this just for the photo, so this isn't exactly how the live show was presented. My mother Peggy made and painted all of the scenery, as well as Jack's beanstalk chopping axe. Above and below are some publicity photos for the Jack and the Beanstalk show. 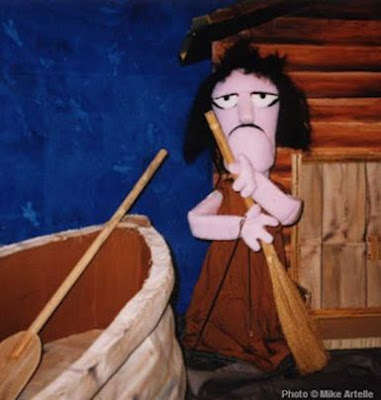 The Fisherman and the Golden Fish: This show was created in the mid 1990's and featured Mr. Fishy as the golden fish. Above is Vera the fisherman's bossy wife. Later I made Vera a witch costume, so she is now Vera the Witch. 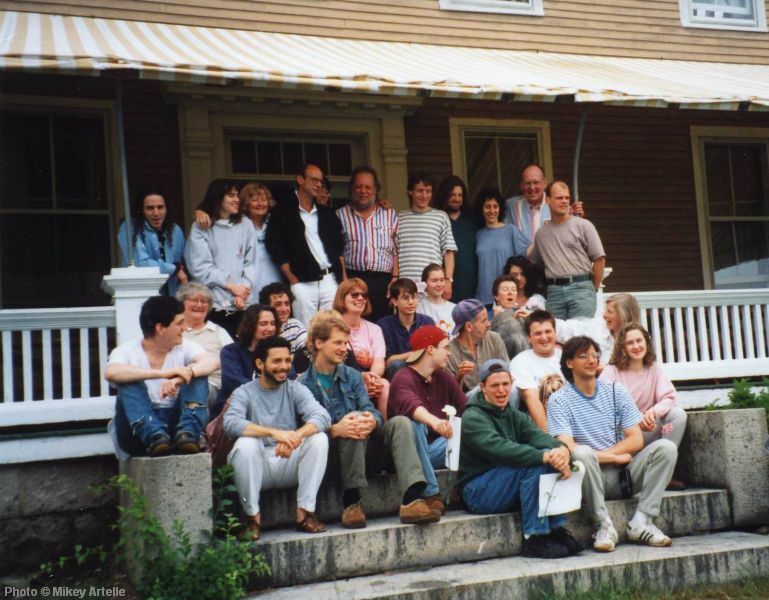 5th National Puppetry Conference: In 1995 I attended the 5th National Puppetry Conference in Waterford Connecticut. The week long event was held at the Eugene O'Neil Theatre Centre. 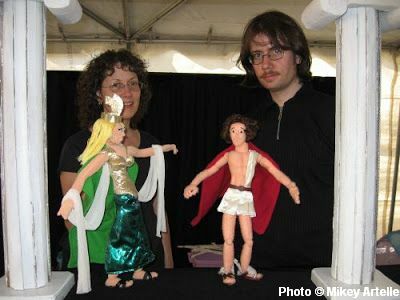 I had previously attended puppetry festivals and various workshops, however this was the first time that I had gathered with other like minded artists with a serious passion for puppetry in order to create puppetry. It was quite a remarkable experience, and overwhelming in a good way. Gordon the Sea Monster, Mr. Fishy, Tyler the Bear, and Brian the Lion, came along for the trip too. (It was a challenge to get a Lion through customs!) During the conference I began to create another story about Gordon called "The Sea Monster and the King", during which Brian became King Brian the Lion. The moment that I had arrived at the Eugene O'Neil Centre Jane Henson walked by me and went inside. I had no idea that she would be there. It took some measure of control not to geek-out right on the spot! During the conference she graciously signed my copy of Jim Henson the Works. Later she gave me a copy of The Art of the Muppets, which she had brought with her to the conference to use during her presentation about Jim Henson. Amazing! At the end of the week all the puppeteers presented the skits that they had created during the conference. I didn't realize that I was supposed to get tickets for my parents to attend. When Ms. Henson found out that I couldn't get tickets because they were sold out, she was appalled and leaned right through the ticket booth window opening to discuss the situation with the attendant. A moment later everything had been taken care of and I had two tickets on the house, courtesy of Jane Henson! As part of the evenings presentation I performed Gordon the Sea Monster and Tyler the Bear in two scenes from what would later become "The Sea Monster and the King". 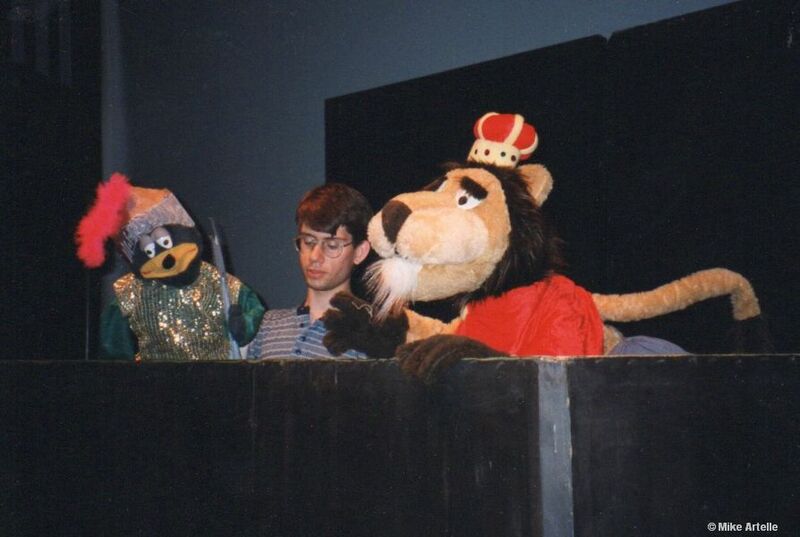 Two other puppeteers (Pam and Art) helped out with performing King Brian and Mr. Fishy, as well as Gordon's right hand. It was quite an honour to perform Gordon the Sea Monster with Ms. Henson in the audience. This group photo was taken on the last day of the conference. In addition to Jane Henson (seated far left next to the post) I met Heather Henson (front row, far right in pink shirt), George Latshaw (back row, far right in striped shirt) Annie Evans (seated in front of Jane Henson, in blue shirt), and Bart Roccoberton (back row centre with beard). I'm sitting in front of Mr. Roccoberton with the purple shirt. After the conference, Annie Evens, a writer for Sesame Street, kindly invited me to visit the Sesame Street studio in New York where I met Martin P. Robinson (puppeteer for Telly Monster and Snuffleupagus) and Pam Arciero (puppeteer for Grundgetta Grouch). While in New York, I also visited Jim Henson Productions and the Muppet Workshop where I saw Kermit the Frog himself! 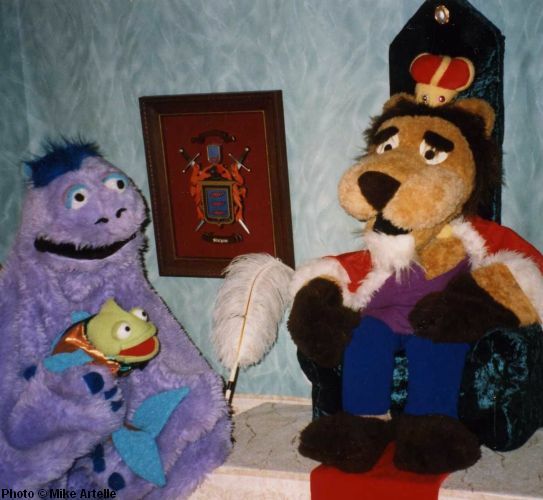 Fuzzy Fables: The Sea Monster and the King (Video): During the summer of 1997 some friends helped me to make a 20 minute video titled "Fuzzy Fables: The Sea Monster and the King". This was the story that I had started at the 5th National Puppetry Conference two years earlier.The above photo shows a scene from the video, with Gordon the Sea Monster and King Brian the Lion as the two main characters. Gordon's pal Mr. Fishy also had a key role. Ned the Nasty Troll, who had been in the Three Billy Goats show, returned as the villain. The Sea Monster and the King (Puppet Show): After the above video was finished I reworked the story into a live touring show, with help from my friend Jay performing King Brian. I used the scenery from "The Three Billy Goats" show and turned it into a castle with a jaw bridge. 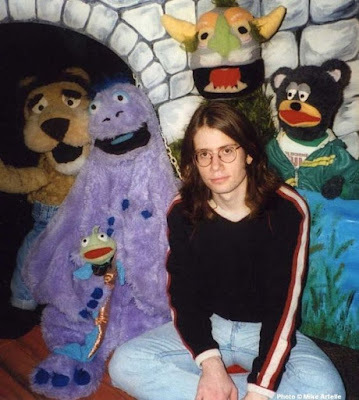 The above group photo of me with the puppets in 1997 is one of the few that I have showing any of the set from the live version of this story. 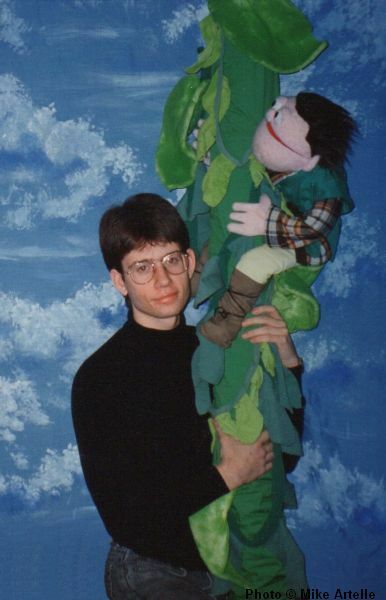 Beanstalk Opera: During the late 1990s and early 2000s my mother Peggy and I created several skits for the Ottawa Puppetry Club's annual variety show. I co-founded the organization with some local puppeteers and served as president on several occasions. One of my favourite variety skits was called Beanstalk Opera, and featured Gus the Giant in an operatic version of Jack and the Beanstalk, all told in 3 minutes with gibberish. We had a piano player create some music for us, to which Gus (who I performed) sang "Fe Fi Fo Fum" in a silly way. During this his wife, played by Vera the Witch (performed by my mother), hummed to indicate her worrying about Gus coming home to find Jack. As the skit required three puppeteers we had a puppeteer from the puppet club help us out by performing Jeremy, who was once again dressed in his original Jack costume. 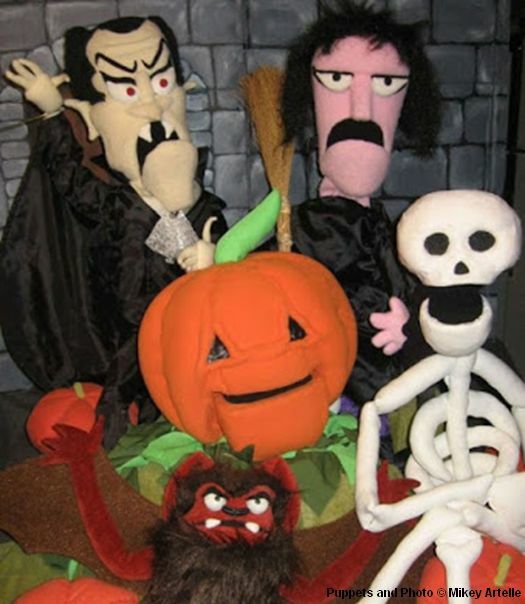 Halloween Show: Sometime in 2000 or 2001 I made a puppet of Dracula for a Halloween show that was unfortunately never completed. In addition to Dracula I made a brown vampire bat and several prop pumpkins for the show. Of course, Vera the Witch joined the cast too. My mother Peggy had previously made a large pumpkin puppet and a skeleton, which I think are awesome. This photo was to be used as a PR photo for the show. Perseus and the Gorgon Medusa: In 2008 I revised the Perseus story from "Heroes Past and Present" to be it's own 45 minute show, adding in some scenes. In addition to other locations, we performed this show at the Canadian Museum of Civilization while they were hosting an exhibit about Greek culture, complete with ancient Greek artifacts! Shadow Puppet Shows for the Lumier Festival: My mother Peggy adores shadow puppets. 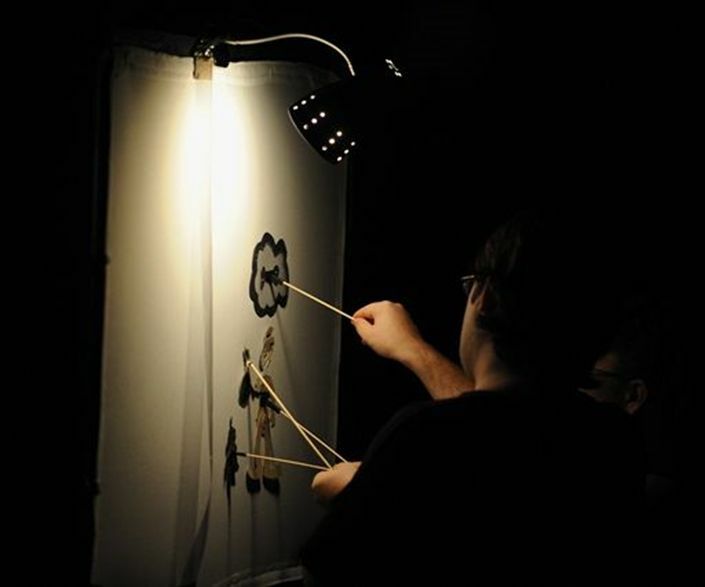 In 2011 and 2012 we performed some shadow puppet shows at the Lumier Festival and also did shadow puppet making workshops each year. I helped draw some of the characters and shapes that would be needed for the puppets used in our show, but they were all built by my mother. She has a certain technique for attaching the rods and making the puppet figures jointed so that they can move. These two photos were taken by the Lumier Festival's photographer. The photo above is from 2012 and shows a behind the scenes look as we perform our shadow puppet show. Below is the view from the audience in 2011 as my mother answers questions following the performance. 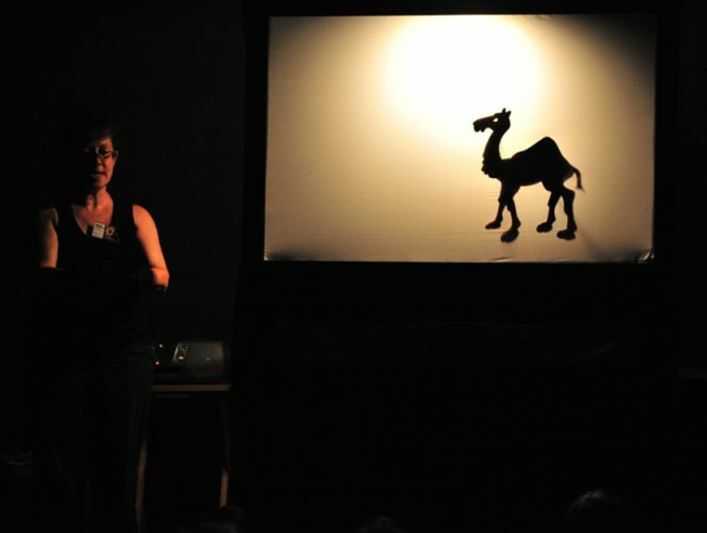 I'm behind the screen operating the camel shadow puppet which she designed and made on her own. These shows were a lot of fun to do. 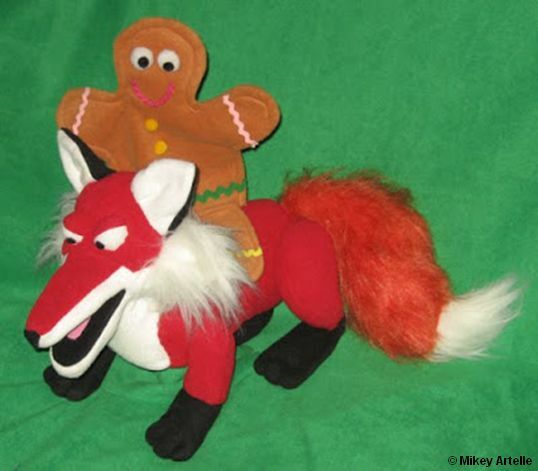 The Gingerbread Man: This show was created in 2014. I built new puppets of all the characters. Here's the little guy himself riding on top of the Fox. We performed this show at schools and daycares.